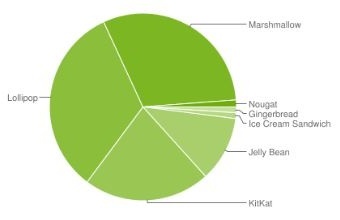 With Froyo finally out of the picture and Nougat still struggling around 1 percent, Android Lollipop continues to dominate the market, closely followed by Marshmallow, each with a share of over 30 percent. Android Lollipop was the uncontested leader of the market for most of 2016, but this might change soon. Although it still leads the market, Lollipop is closely followed by Marshmallow these days, as revealed by Google's numbers. Android Gingerbread and Ice Cream Sandwich should disappear by the end of the year, while Nougat still has to take off properly and this is expected to happen in the second quarter. The most popular OpenGL ES versions remain 3.0, with 42.3 percent, and 2.0, with 40.4 percent. The most frequent screen size and density combination is still normal/hdpi (240 dpi), with 36.6 percent, followed by the same "normal" size (up to 5 inches) and the higher xhdpi density (320 dpi), with 32.8 percent.